Rounded Corner Business Cards is rated 5.0 out of 5 by 1. Trusted By Over 10,000 Customers in the USA. Rounded corner business card printing allows you to create jaw-dropping designs. "We sell at local farmers markets and bazaars. I am astonished at the number of people who take a card and get in touch with us via that exposure…Prior to PrintPlace I was printing business cards at home. The difference is night and day. Thank you for a wonderful and professional product!" Rated 5 out of 5 by Kraig from Nice cards, nice price. I had our business cards done on the vertical orientation with 1/4" rounded corners. They came out looking nice and were printed well. Our rounded corner business cards are available in different sizes. We have 2” x 2” cards for those who want a square card but also offer them in 3.5” x 1.75” and 3.5” x 2” rectangles. There is also a standard business card size (3.5” x 2”) single rounded corner option. Round corner business cards are printed on thick 14 pt. cardstock (with an option of having one or both sides printed with gloss coating). Speaking of coating, you have the option of picking how glossy your cards are. Matte aqueous coating has the least shine while high gloss UV coating makes your cards super shiny. Gloss aqueous coating is somewhere in the middle which makes it a safe bet if you’re unsure how glossy you want your cards to be. The road to having new and exciting business cards starts here. 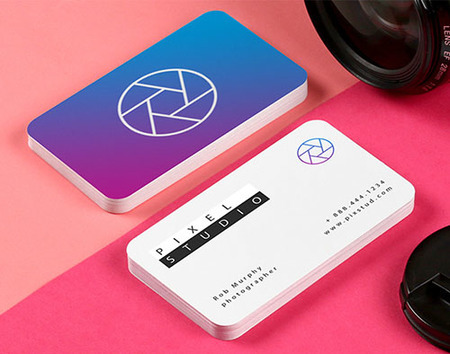 Unlike your usual standard business cards, rounded corner business card printing allows you to be more playful with the design but still look sleek and professional. Because there are no pointed edges, the cards can be stored comfortably inside your shirt pocket. Rounded corner business cards are great for those in the creative space (graphic designers, artists, and the like) as well as businesses that usually interact with a younger audience.